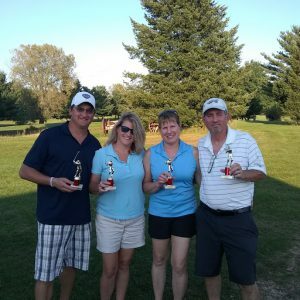 Team “The Neighbors” won 1st place at the 20th Annual Poynette Chamber of Commerce Scholarship Golf Outing on 9.14.18 at Shepherds Meadow Golf Course. From l-r: Aaron and Kristin Aeschlimann, Vicki and Dennis Rodgerson. Thank you to all businesses/individuals that sponsored, donated gifts and helped the Poynette Chamber of Commerce achieve its goal to sponsor $500 scholarships to four 2019 Poynette High School students.